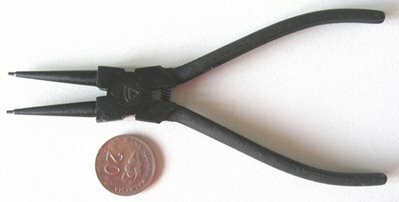 I bought this Round Nose Pliers from Kuala Lumpur two days ago when I was there for a day trip – was there for a meeting at our client’s office in Bangi, near Putrajaya. We (me and another colleague) didn’t have much time to shop (actually we were not there for shopping…my boss will certainly agrees) after the meeting as we have to catch our flight home at 5:50 pm. So, we headed for Alamanda, a shopping mall at Putrajaya as it is the closest to KLIA…. just to make sure we don’t miss our flight home. This round nose pliers is all metal & black in color, about 7 inches long. The packaging didn’t show where it’s made but I suspect it is locally made. Tried to look for other tools but didn’t find any suitable one. Anyway, I tried it last night and not bad except the handle is quite rough as the handles are not wrapped with rubber grip or things like that. I think it will hurt my hand if I use it for long period of time. The tips are fine enough (about 1.5mm diameter) to make very small loop but it doest grip wire finer than 23g. Its not a Lindstrom but for now I am quite satisfied with my buy as it only cost me RM7.90….LOL. Howԁy! Sοmeone in my Мysρace group shareԁ this site with us ѕο I came to loοk it over. I'm definitely loving the information. I'm bookmarking and ωill be twеeting this tο mу followerѕ! Superb blog anԁ teгrіfic dеsign.